But trees are not the only visual model being used for centuries. In 2001, Martin Wattenberg introduced a novel way of visualizing a song as a sequence of translucent arcs with varying width. The method showcased in The Shape of Song is better described by Wattenberg himself: “Each arch connects two repeated, identical passages of a composition. By using repeated passages as signposts, the diagram illustrates the deep structure of the composition.” The project website shows a striking gallery of images that give shape to various songs by artists such as Bach, Madonna, and Philip Glass. However, this method is not entirely new. 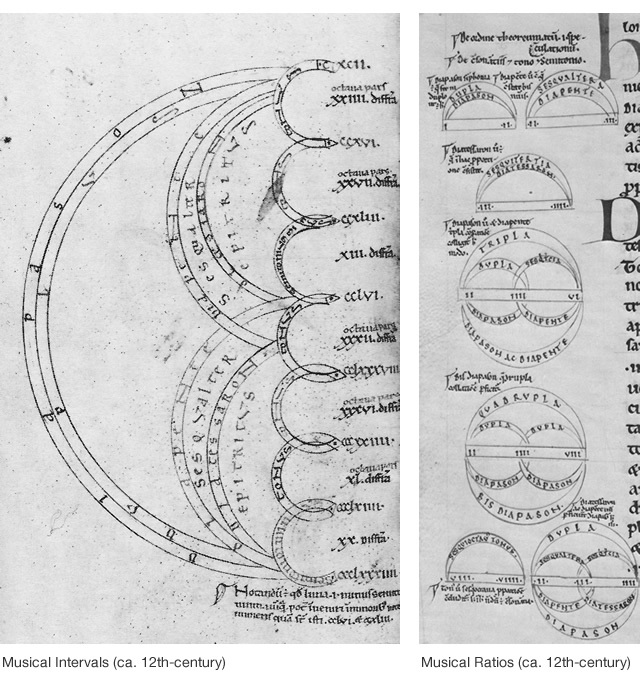 In fact, arc diagrams have been used for over a thousand years and were particularly popular in middle-age Europe in the depiction of, guess what, musical compositions. 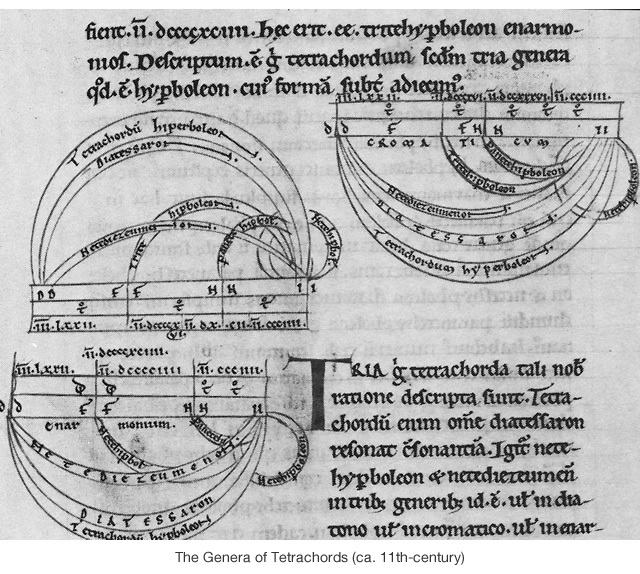 Many of these intricate diagrams accompanied medieval texts on musical theory and aimed at translating complex sequences of musical tones and intervals, such as tetrachords, in order to facilitate understanding. They were ultimately educational tools meant to be attentively studied and analysed. But from all the cases I found, the double-page chart below from a 13th-century manuscript is arguably one of the most complex and intricate examples of this old technique. 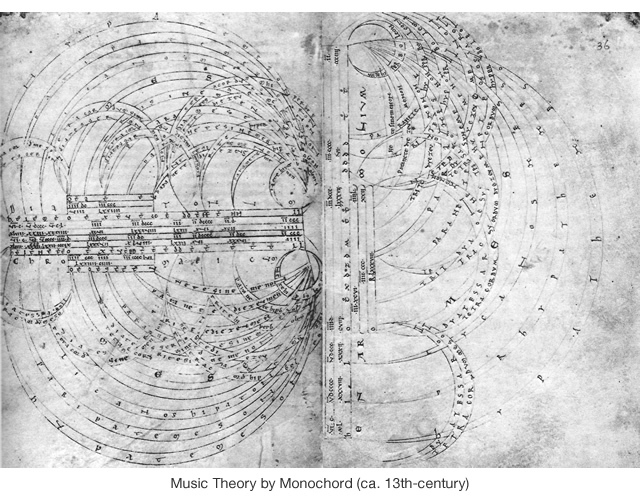 A great specimen of medieval visual exegesis that served as a teaching tool for musical theory, this graph represents the various divisions of a monochord–an ancient single-string musical instrument. * Ancient arc diagrams from: Murdoch, John E. Antiquity and the Middle Ages. Vol. 5 of Album of Science. New York: Scribner, 1984. 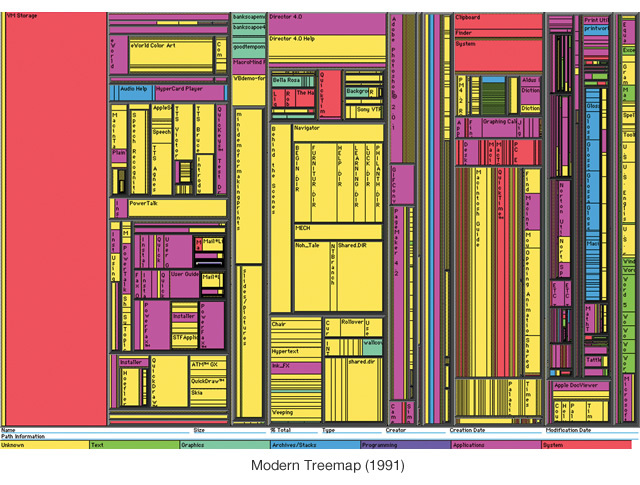 Shneiderman is certainly the father of the modern, computer-generated treemap, which introduced an important recursive tilling algorithm able to handle large, multi-level hierarchies. But the concept was not entirely groundbreaking. 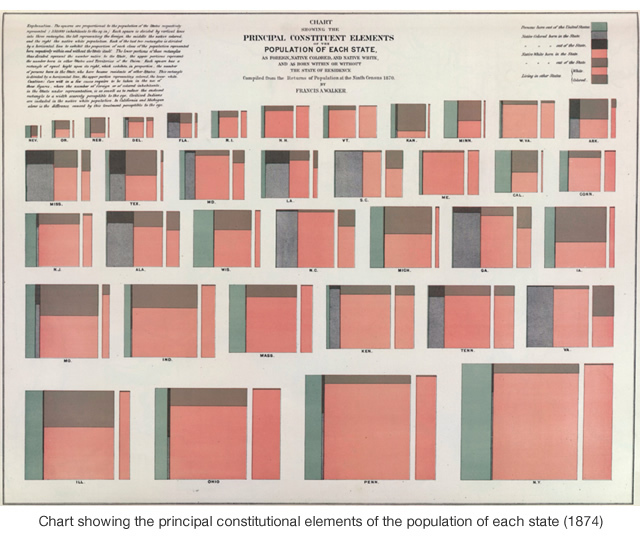 Area diagrams and simplified rectangular treemaps had been in use for several decades before Shneiderman’s preeminent work. The image below shows a comparative diagram showing the size and population of each continent and country of the world, part of a world atlas compiled in 1845. This is a four-level treemap, where the world (1) is comprised of three major “continents” (2), divided into regions (3), and further subdivided into individual countries (4). The following chart is perhaps known to some of you, since it has surfaced in a few places in print and online like Fast Company. It is not only one of the earliest examples of a rectangular treemap, but also makes a compelling use of the small multiples technique. As with many other contemporary visualization techniques, the previous examples show us that the roots of arc diagrams and treemaps are considerably deeper than what they seem. Even though I only explored two visual methods in this post, a similar analysis could easily embrace many other present-day models. Others, such as hyperbolic trees, seem to be genuinely digital-native, given it’s dynamic exploration of hyperbolic space and reliability on human-computer interaction. Still, their unmistakable predecessors - radial trees - have been in use for several decades, and many researchers and artists, most notably E. C. Escher, have throughly investigated hyperbolic geometry in their work.